Coral Beach Gem Spa is a stunning, 40,000 square-foot spa located onsite at the Grand Fiesta Americana Coral Beach Cancun resort. This luxury spa was just been awarded a Four Star Rating for 2017 from the prestigious Forbes Travel Guide. Since 1958, the respected Forbes Travel Guide has offered travelers around the world valuable information. It’s been recognized as providing the most comprehensive reviews and ratings of hotels, spas and restaurants in the travel industry. Properties are evaluated by experienced inspectors and utilize an extensive list of 800 standards. The ultimate goal of the Forbes Travel Guide is to assist people to make the right choice for their specific travel needs. Grand Fiesta Americana Coral Beach Cancun Resort and Spa can be found in Cancun, Mexico. The luxury resort is located on a private piece of white sand beach. This spectacular spa includes 602 all-suite ocean front accommodations. Each suite comes with a private and spacious terrace. Gaze out towards the Caribbean Sea and the property’s lagoon-like pool. As the originator of the leading Star Rating system, the Forbes Travel Guide has given Gem Spa the first ever Four Star Rating. This high quality, Cancun spa offers a variety of luxury spa treatments. It is now one of only two spas with the Four Star Rating in Cancun. It’s definitely an honor that Gem Spa, as well as Grand Fiesta Americana Coral Beach Cancun resort appreciate. By offering countless luxury spa amenities, Gem Spa is in a class by itself. Its offerings integrate the cultural influence of surrounding Cancun. As an example, its spa treatments utilize chakra-balancing gems. These gems are inspired by ancient Mayan healing practices. To start, each treatment is initiated with a unique ten-step hydrotherapy ritual. This truly relaxing process takes each customer on a journey of various water temperatures and pressures. Gem Spa is expansive and covers over two stories of the Cancun resort. You quickly realize you’re in for a VIP experience treat. 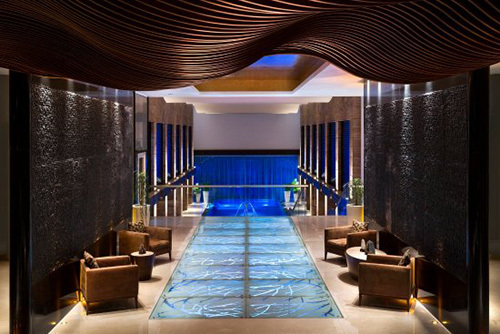 The design of the spa includes a lavish decor consisting of rich woods and sand marble. In addition, you’ll notice lighted Italian mosaics and a variety of gorgeous water features. It’s a tranquil setting that quickly helps to relax both your body and mind. Take a much deserved vacation in Mexico and stat at the Grand Fiesta Americana Coral Beach Cancun Resort and Spa. Get pampered at Four Star Rating – Gem Spa. Return soon to follow our luxury blog. Read about the best vacation spots in the world.